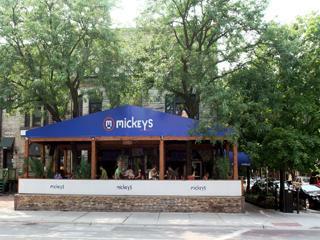 MICKEYS SNACK BAR is yet another excellent neighborhood bar that stays open late (until 3:00 AM!) on Saturdays. We love it in the summertime because they've got that great outdoor patio. That's a huge draw for all the residents of Chicago's Lincoln Park. It also makes it a really great space to rent out for private parties including birthdays and bachelor and bachelorette parties. This is one of our favorite sports bars too, with tons of televisions always tuned to the big games of the day. Great location and attractive waitstaff! Always a great time to be had at Mickeys Snack Bar.